Background Heated tobacco product(s) (HTP), also called heat-not-burn products, are a re-emerging class of tobacco products that purport to reduce health risk compared with smoking combustible tobacco products. This study examined the potential toxic effects of inhaling emissions from an HTP in comparison with electronic and combustible tobacco cigarettes. Methods Inhalation toxicity of HTP (IQOS; tobacco flavour), e-cigarette (MarkTen; tobacco flavour) and tobacco cigarette (Marlboro Red) was examined in vitro using an air–liquid interface with human bronchial epithelial cells (H292). Cells were exposed directly to 55 puffs from the e-cigarette, 12 puffs from the HTP and 8 puffs from the tobacco cigarette to equilibrate nicotine delivery to the cells across products. Cytotoxicity was measured using neutral red uptake and trypan blue assays. Cytotoxic effects of each tested product (HTP, e-cigarette and tobacco cigarette) were compared with an air control. Release of inflammatory markers (cytokines) was measured using ELISA. Results The HTP showed higher cytotoxicity compared with the air controls using the neutral red assay. The HTP also showed higher cytotoxicity than the e-cigarette, but lower cytotoxicity than the combustible cigarettes using the same assay. A significant increase in cytokines levels, compared with air controls, was observed postexposure to tobacco smoke but not to emissions from HTP or e-cigarette aerosol. Discussion Using limited cytotoxic measures, the HTP showed reduced cytotoxicity relative to a combustible cigarette but higher toxicity than an e-cigarette. More comprehensive testing is needed to determine long-term effects of inhaling emissions from HTP. Although all of above-cited studies evaluated relative effects of IQOS to combustible cigarettes, none of the studies cited above compared toxicity of IQOS to e-cigarettes. Independent research is therefore urgently needed to provide a balanced view on absolute potential health impact of HTP and the relative effects compared with other potential reduced-risk products like e-cigarettes. Since there is a critical knowledge gap in the potential impact of HTP emissions on respiratory health, this study examined the potential cytotoxic effects of inhaling emissions from an HTP in comparison with the electronic and combustible cigarettes using an in-vitro model. Three nicotine-containing products made by PMI were used in this study: (1) HTP (IQOS; with the PMI Amber HeatSticks (HEETS), (2) e-cigarettes (MarkTen brand; 3.5% nicotine, tobacco flavoured) and (3) tobacco cigarette (Marlboro Red 85 mm). The HTP was purchased in Florence, Italy, and the electronic and tobacco cigarettes were purchased in Buffalo, USA. Emissions from tested products were generated using a Borgwaldt LX-1 (Richmond, Virginia, USA) single-port, piston-operated smoking machine. The Health Canada Intense puffing protocol was used with the following conditions: 2 s puff duration, every 30 s, with a 55 mL puff volume. The number of puffs varied, depending on the product tested, to represent one smoking session. This was accomplished by using one tobacco cigarette and one HTP HEETS, and then matching nicotine delivery from one HTP HEETS to an e-cigarette. In our previous smoking-machine study using the Health Canada Intense puffing protocol,7 we found that one tobacco cigarette delivered 2.1 mg/cigarette in 8 puffs, the HTP delivered 1.4 mg/HEETS in 12 puffs and the e-cigarette delivered a similar amount of nicotine as the HTP 1.3 mg/session with 55 puffs.7 Air exposures (control), 55 puffs over a total of 30 min, were run during each experiment. Cells were acutely exposed, on three separate days, to emissions (both gas phase and particulates), aerosol or smoke from tobacco products using an air–liquid interface (ALI) interface. The NCI-H292 human bronchial epithelial cell line (ATCC) was plated on 0.4 µm permeable supports (PS) 24 hours prior to experimentation under previously described conditions.8 Immediately prior to exposure, the media were removed from the apical side of the PS, and cell-containing inserts (n=3) were placed in the ALI chamber. While the apical side of the cells were directly exposed to either: (1) an air control, (2) emissions from HTP, (3) aerosol from e-cigarettes or (4) smoke from tobacco cigarettes, fresh media were cycled over the basal side of the PS at a flow rate of 5 mL/min. After exposure, the apical side was resubmerged with complete or neutral red media until assay measurements 2.5 hours later. The ALI chamber was cleaned with methanol and distilled water between each of the four exposure conditions. A detailed description of this exposure system can be found in our previous study8 and online supplementary materials. After 2.5 hours, cytotoxicity of exposed H292 cells was measured using two assays: neutral red uptake and trypan blue assays. The neutral red uptake assay provides a quantitative estimation of the number of metabolically active cells attached to the PS, based on the ability of viable cells to incorporate and bind the supravital dye neutral red into lysosomes.9 The trypan blue assay, a cell viability assay, is based on the principle that live cells possess intact cell membranes that exclude certain dyes, such as trypan blue, whereas dead cells do not.10 This assay measured the number of live cells attached to the PS (removed by trypsin) and the number of dead cells in the fresh apical media. Cytokines released into the fresh apical media were measured as an indicator of cell inflammatory response. Six cytokines (interleukin (IL)-1β, IL-6, IL-10, CXCL1, CXCL2 and CXCL10) were measured using commercially available ELISA kits (Abcam and R&D System) following the manufacturers’ protocols. These cytokines were chosen as a panel of inflammatory markers commonly used in in-vitro, in-vivo and clinical human studies. Changes in those markers have been shown to correlate with several clinically relevant outcomes and diseases.11–15 A detailed description of these assays can be found in our previous study8 and online supplementary materials. Statistical analysis was performed using Prism V.6.07 (GraphPad). Kruskal-Wallis non-parametric tests and Dunn multiple comparison tests were performed for each study outcome to compare: (1) each product versus air controls, (2) combustible cigarettes versus HTP and (3) e-cigarettes versus HTP. All experiments were performed in triplicate, with each outcome measured three times per experiment (three wells per chamber). Metabolic activity of H292 cells decreased significantly after exposure to HTP emissions compared with the air control (p=0.002, figure 1). 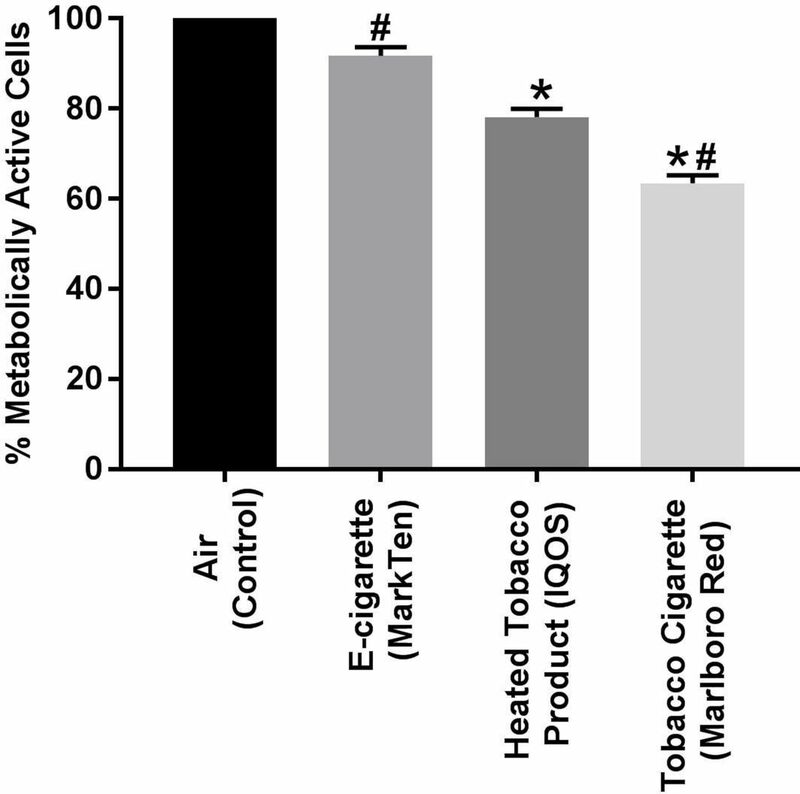 Exposure to combustible tobacco smoke but not to e-cigarette aerosols also resulted in decreased cell viability (p<0.001, online supplementary figure 1) and metabolic activity (p<0.001, figure 1), compared with the air controls. The neutral red assay, but not the trypan blue assay, revealed that IQOS emissions were significantly more toxic compared with e-cigarette aerosol (p=0.044, figure 1 and online supplementary figure 1). Metabolic activity (neutral red assay) from H292 bronchial epithelial cells directly exposed using an air–liquid interface to emissions from heated tobacco product (HTP), e-cigarette, combustible tobacco cigarette and air (controls). Emissions were generated from a MarkTen electronic cigarette (55 puffs), IQOS HTP (12 puffs/heetstick) and Marlboro Red combustible cigarette (eight puffs/cigarette). *Significant difference compared with the air control (p<0.05). #Significant difference compared with IQOS product (p<0.05). We were only able to detect IL-1β and IL-6 released to media after exposure to all tested products; all other cytokine levels were below the limit of quantitation. There was no statistically significant differences between cytokines levels released postexposure to HTP emissions compared with air controls (IL-1β: 13.7±5.1 vs 13.5±6.4; IL-6: 6.9±2.1 vs 11.8±3.2 pg/107 cells; mean±SD; all p>0.05, online supplementary figures 2 and 3). HTP showed reduced release of cytokines compared with combustible cigarettes (IL-1β: 13.7±5.1 vs 133.6±41.9; IL-6: 6.9±2.1 vs 65.5±21.7 pg/107 cells; all p<0.05, online supplementary figures 2 and 3). Levels of cytokines measured postexposure to HTP did not differ statistically from levels detected postexposure e-cigarettes (IL-1β: 13.7±5.1 vs 12.9±4.7; IL-6: 6.9±2.1 vs 12.2±2.7 pg/107 cells; all p<0.05, online supplementary figures 2 and 3). Smoke generated from tobacco cigarettes increased cytokine levels compared with air controls, as well as the two other products (p<0.05). This pilot study used an established ALI system to examine the cytotoxic and inflammatory effects of an HTP. Our results show that emissions from HTP caused damage to human bronchial epithelial cells relative to air controls. At the same time, HTP emissions showed lower toxicity compared with combustible cigarettes but higher toxicity compared with e-cigarettes. Our data suggest that use of IQOS products may lead to increased risk of respiratory health impairment, and although this risk may be reduced compared with smoking tobacco cigarettes, it is likely to be higher than risk from vaping e-cigarettes.16 However, it is important to note that the data presented have shown the relative effects of acute exposure to three different tobacco products and that further research is needed to determine the long-term health effects of the HTP product use. An important limitation of our study is that we have used a single type of immortalised cell line to examine cytotoxicity. Although the ALI exposure provides a novel and specific exposure approach for performing the biological study on health effects related to inhalation of emerging tobacco products, extrapolating data from in-vitro studies to human risks remains hypothetical.18 This model may not recapitulate how these products affect tissues and do not aim to estimate any harmful effects in IQOS users. Future in-vitro studies with organotypic models as well as in-vivo animal studies are needed to confirm our findings. When real-life data on IQOS users’ behaviours and puffing topography are available, future studies should adopt an appropriate exposure protocol that reflects real-life product use conditions.19 Finally, since our study focused on the acute toxic effects of HTP, our observations require verification in chronic exposure models, more relevant to regular use of HTP. The extent to which heated tobacco product(s) (HTP) impact respiratory health is currently not defined. We tested cytotoxicity of HTP using cell viability and metabolic activity assays and examined the release of inflammatory cytokines in bronchial epithelial cells. These cells were exposed in vitro directly to HTP emissions and the results were compared with the observed effects after exposure to air (controls), e-cigarette aerosols and smoke from combustible tobacco cigarettes. We found that emissions from HTP damaged bronchial epithelial cells, and their cytotoxic effect was higher compared with e-cigarettes but lower compared with combustible tobacco cigarettes. Contributors MLG contributed to the conception of the work. MLG and NJL contributed to data analysis. MLG, NJL and RJO drafted the manuscript. NJL and PLT ran all experiments. All authors approved the final version of the manuscript. MLG has full access to all study data and takes responsibility for the integrity of the data and accuracy of the data analysis. Funding Research reported in this publication was supported by the National Cancer Institute of the National Institutes of Health under Award Number P01 CA 200512 and P30 CA 016056. Competing interests MLG reports grants from and served as an advisory board member to pharmaceutical companies that manufacture smoking cessation drugs. RJO was a member of the FDA Tobacco Products Scientific Advisory Committee which considered Philip Morris International’s modified risk application for IQOS in January 2018. Other authors declare no conflict of interest.